July is the month that we celebrate our nation’s birth. It is the the month when in 1971 that Neil Armstrong first stepped foot on the moon and it might also just happens to be the month you were born in. July’s birthstone is Ruby. Did you you know that ruby and sapphire are created from the same mineral? Corundum is the base mineral for both ruby and sapphire. Trace elements in each mineral create the color. In fact 17 minerals have a red variety stone. The lore of birthstones seems to be rooted in Biblical texts as Aaron’s breast plate contained twelve stones representing the twelve tribes of Israel. Fame Tiffany geologist George Frederick Kuhn states that the modern birthstone tradition is linked to Europe in the middle ages. The word ruby is derived from the latin word for red, ruber, and according to Chevaliere Jean de Mandeville, a 14th century writer of gemological texts, suggested that a ruby can acquire and maintain the power of a ruler. 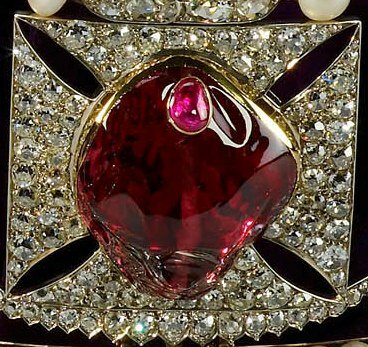 It seems only appropriate that one of the most famous rubies can be found in the crown jewels of the United Kingdom and is called the Black Prince’s Ruby. You might remember the Black Prince from A Knight’s Tale with Heath Ledger. The Black Prince was the unknown knight that Heath Ledger fights early in the movie and who ultimately provides Ledger’s character his redemption from serfdom. In real life the Black Prince was Edward of Woodstock, the eldest son of King Edward III, the First Knight of the Garter, the Prince of Whales. 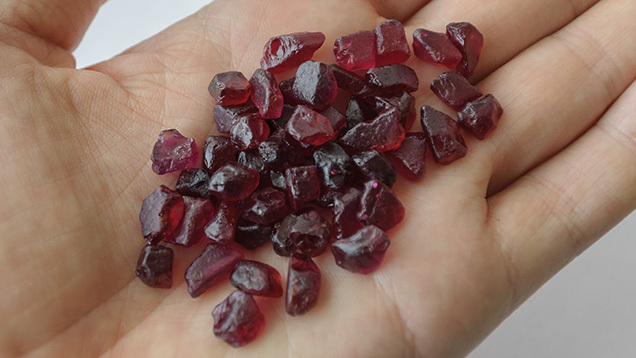 Modern gemstone identification techniques revealed that the 170 carat “ruby” is not the mineral corundum but rather a red spinel. Consequently, one of the most famous rubies of antiquity, is really not a ruby at all, but a lowly red spinel (actually any large gemstone is a rarity) and will throughout eternity be known as the Black Prince’s Ruby. So if your birthstone is a ruby may you acquire and maintain all the power you will ever need. P.S. The crown containing the Black Prince’s Ruby also contains one of the world’s most famous diamonds, the Cullinan II (there are a total of seven major diamonds named Cullinan I – VII, all cut from the largest diamond ever found, the 3106 carat Cullinan – but that is another story).